My Ericson 30 came without a name. It used to have one, but the previous owner didn't like it and took it off. I don't know what it was. No matter because with one exception, I've always given my boats a name of my own choosing. There are superstitions about changing boat names, which is entertaining for those who care. I'm not one for either superstition or ceremony, so the most difficult thing about changing a boat name for me is getting the old name off. That can be quite a chore if its painted on. The most useful reason for naming a boat is so that your friends can easily hail you on the marine VHF radio by simply saying the boat name on Channel 16 and giving their boat name for your response. "Narrow Escape, this Pelican calling," for example. And I respond "Pelican, this is Narrow Escape. Over. If your boat doesn't have a radio there's not much point in naming it.You may also want to put your hailing port on the transom. When you're anchored in a quiet cove somewhere, others in the vicinity will know where you're from. Must have been a tough sail all the way from Phoenix, AZ. But there are no Coast Guard or any other rules about what constitutes a hailing port, so a lot of people put their residence on their boat. I use the location where my boat is berthed. If it was a trailer sailor, I'd probably put my city name on the transom. You can look up various listings of most popular boat names on the internet. My goal has always been to have a unique name, so it would be disappointing to find my boat name on such a list. I also like names that are descriptive or meaningful, especially if they can have more than one meaning. 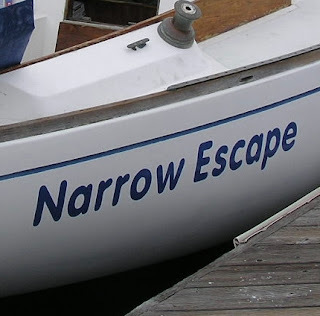 "Narrow Escape" came to me fairly easily. At 9 feet, 6 inches, the Ericson is narrow for a thirty footer. And its my escape. From land, from boredom, from other obligations, from all sorts of things. It is a name that people seem to connect with. At Isthmus Cove recently, a lovely young woman came paddling by in kayak and paused. "Narrow Escape," she said. "Yeah, I know all about that. We just spent 15 days sailing here from La Paz." This is the eighth boat which I've owned or had an interest in since 1974. Only one retained its previous name, Popeye, a Catalina 22, that came with Popeye-motif curtains and other decorations. The first that I named myself was an Islander 32, Mirth. It was a family boat when my two children were young, and the name described the typical atmosphere aboard that boat. Later, after a divorce, there was a Pearson Triton 28, which I named Metaphor. The children were a little older, I had them on weekends and we spent glorious hours together on that boat. The name was perfect on many levels. Along the way was a Nordica 20, owned by an out-of-town friend. I paid for the slip, insurance and maintenance and got to call it Brio. I liked the jaunty sound of it, although I'll confess that I didn't always feel jaunty the time I sailed it single-handed for 35 hours to get from San Diego to Avalon. Later came a Catalina 30. IBM's super computer had recently won a chess match against a human champ and Deep Blue seemed the perfect name. I sailed it on the deep blue sea, the upholstery and sail covers were dark navy blue, not the more common, lighter, royal blue. And my life seemed to be having its ups and downs. Then there was Wave Theory. This Cal 33 was named Manuia 4 by its original owner, an island word that had meaning to him. I found it just hard to pronounce, and explain. Besides, now it was my boat (actually it was mostly the bank's boat). The name came from a concept my son had about the fundamental workings of the universe. The colorful red, orange and blue pattern I used as the fill color for the vinyl lettering came from one of his computer simulations of the theory. It seemed to me like nothing epitomized the implementation of another kind of wave theory better than a sailboat. Painting a boat name onto a hull is a complex skill. You don't want to buy a brush, a can of paint and try it yourself. On the other hand, using adhesive-backed lettering systems, just looks cheesy. But what is easy is taking your request to the local sign shop, which can design most anything you want on a computer screen and then cut it in self-stick vinyl. Applying a name made that way merely takes a little care and the result looks professional.